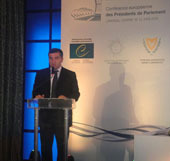 On June 12 the Chair of Georgian Parliament began an official two-day visit to Cyprus. Davit Bakradze left for the island to attend the International Conference of Speakers of Council of Europe member countries' parliaments. He made a speech at the conference and held bilateral meetings with the Chairmen of the Parliaments of Armenia, Azerbaijan and Croatia. During the visit the Georgian Speaker also met Chair of the Parliament of the Republic of Cyprus Marios Garoyan. The leaders of the majority and minority groups in the Georgian Parliament attended this meeting as well. The importance of the conference was underlined at this meeting. Issues of bilateral cooperation were also discussed. Representatives of both sides said that the current approach to the country’s territorial integrity and independence should not change. They also agreed that the Parliamentary friendship groups of the two countries will conduct exchange visits in autumn this year. Bakradze invited Garoyan to Georgia and also met representatives of the Georgian Diaspora after the conference. “This is a very representative forum which gave us a good chance to talk about the ongoing processes and democratic reforms in Georgia and the pain we are suffering due to the foreign occupation. Georgia’s participation in this kind of forum is one of the conditions for our country becoming a fully-fledged member of the European family,” Bakradze said.